The Internet is quickly becoming the backbone for the worldwide information society of the future. Point-to-point communication dominates the network today, however, group communication--using multicast technology--will rapidly gain importance as digital, audio, and video transmission, push technology for the Web, and distribution of software updates to millions of end users become ubiquitous. 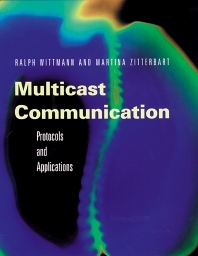 Multicast Communication: Protocols and Applications explains how and why multicast technology is the key to this transition. This book provides network engineers, designers, and administrators with the underlying concepts as well as a complete and detailed description of the protocols and algorithms that comprise multicast. Ralph Wittmann is in the research group for High Performance Networking and Multimedia Systems at the Technical University of Braunschweig. His research interests are mainly concerned with multicast and multimedia communications in heterogeneous environments. Martina Zitterbart is full professor in computer science at the Technical University of Braunschweig, Germany. Her primary research interests are in multimedia communication systems, internetworking and conferencing applications.